A key event photography requirement is offering onsite posed photos of guests in front of a special background, then preparing and providing guests either digital or printed photos. Onsite posed photos and printing is becoming an increasingly popular event photography request in the San Diego area and elsewhere. In this article I’ll talk about seven onsite event photo and portrait background ideas and show samples of each from real events that we’ve shot. In a later article I’ll touch on the printing of those posed photos, both onsite so that guests can take the photos home, or for later delivery to event organizers. 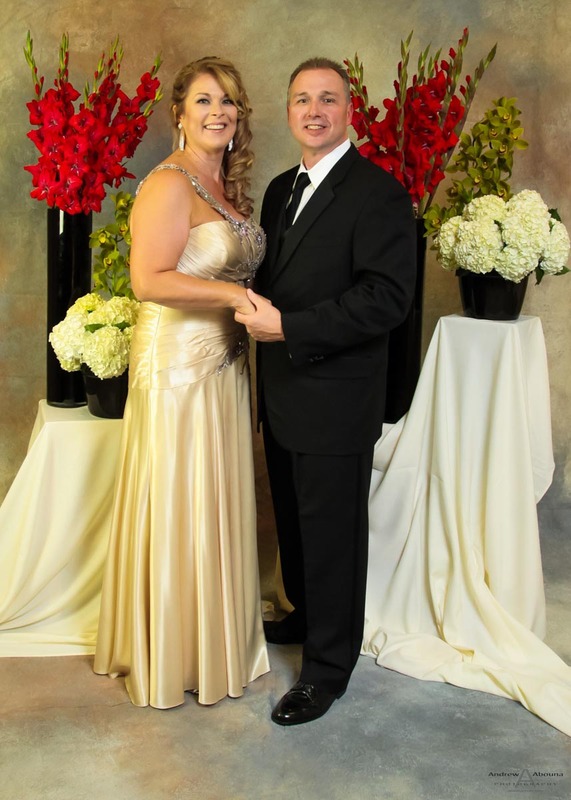 Many companies and organizations that hold annual celebrations, gala events, and other special events request posed photos of couples, groups, individuals, VIPs, and company icons. 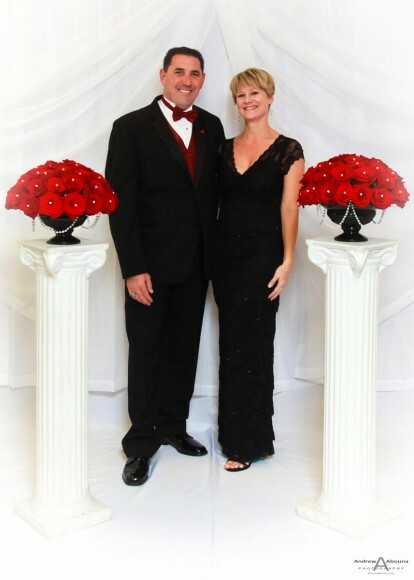 Posed event photos using like these portraits background ideas isn’t limited to just these types of events though, as we also provide these at weddings, receptions, parties, and graduation ceremonies. Posed event photos, created using professional studio photography backdrops and lighting setups, provides a first-class way to have a personal and lasting keepsake of an event. A very important element to provide a client, who wishes to offer their guests a uniform and printed memento of an event, is the appropriate backdrop, sometimes also referred to as background. Selection of the correct backdrop is also an important factor. Backdrops can be a solid in color, hand painted, step and repeat, custom made from various fabrics or other materials, or even a scenic mural. Below we’ll take a look at some ideas for different backdrops and I’ll show you actual event photography backgrounds and the results available with them. Lighting is another element that can be very important to posed event backdrop photography. Studio-type lighting is important because it helps ensure proper lighting of the subjects being photographed, and it can be used to best accent and not detract from the background. Correct lighting also results in evenly lit subjects and fewer shadows. Studio lighting, such as strobes, and umbrellas or light boxes, does more than just provide even lighting. 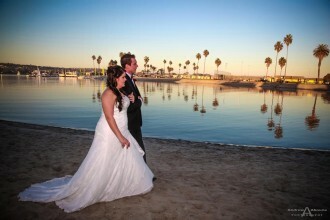 It also helps guests feel confident that professional photos are being taken. The benefit of this is two-fold. First, the professionalism of studio lighting befits guests who often are wearing formal attire such as evening dresses and black tie suits. And second, by making the guest feel special, superior photography results come about as often a person will present themselves even better because the photographer is providing a professional atmosphere for their posed photo. One more thing that’s very important when using photography backgrounds is to use backdrops of professional quality and in sufficient quantity for the size of the event. When shooting large events, we always setup at least two photography stations to make sure the volume of guests are handled in a timely fashion. This requires the use of two photographers. Using two photographers, each with an assistant, we minimize guest wait time while also being able to properly log the photo numbers to the right person. This translates into providing good quality service in a number of ways. First, the guests wait a minimal amount of time for their turn to be posed and photographed. Second, the pose itself is aided with this efficiency because the photographer can direct more attention to the guest. Third, the guest will be less anxious about having to wait and thereby will generally pose themselves more naturally. A natural pose is one of the hallmarks of a great photograph. Recording and correlating image numbers to client can also be helpful when processing the prints after the shoot, because it ensures the right guest receives the right photo. Sometimes digital images or prints are provided at the event or supplied to them at a later time. In either case, the guest needs to receive the proper image. In a later article, I’ll talk more about printing event photos onsite or providing them after the event. Suffice it to say, when the appropriate number of backdrops and photographers are used workflow is efficient, and this makes for professional photography results. 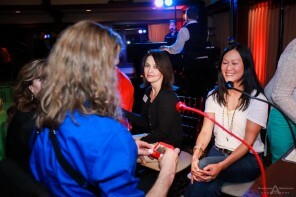 Posed event photo photography can be designed around an event’s theme. 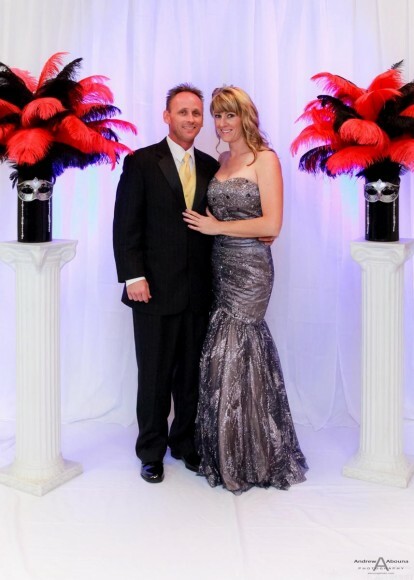 Choosing from one of many portrait background ideas can also help define an event’s theme. The use of colors and background style are all very flexible and can be modified to fit the theme of any event. Costumed characters that pose with the subjects in the photo. Additional items (such as pedestals with flowers, décor, or even dress-up props for guests) can also be used with a backdrop to help build upon an event’s theme. In the following section we’ll see examples of all of these. Let’s take a look at some examples of posed event photography, portrait backdrops that we’ve used for our clients. For a Discount Tire Celebration and Awards Photography at the Hyatt La Jolla in San Diego we used a hand-painted, Old Masters muslin background, and four accenting bouquets. The flowers used in this example were created by Valley Center Floral. The look and feel of this posed event photo station was altogether different. Here we offered the option for seating to give a real photography studio feel to the posing. Hand-painted backdrops are available in a wide variety. Final products included digital images online and on disk, and prints that were delivered in premium photo folders. 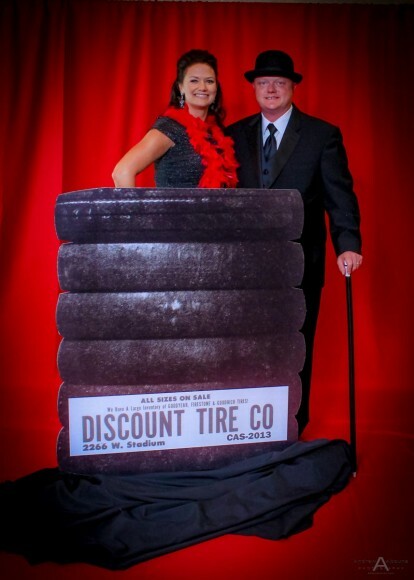 For a Discount Tire Celebration and Awards Photography at the Hyatt La Jolla in San Diego, CA, we used two photography stations, each with different kinds of backgrounds. One posed event photo station was created using layers of a white sheer, pleated fabric set against a solid white background. The main white background also extended onto the floor to ensure a clean white look across the entire photo. Two white columns were positioned in front of the background, and atop each column was a bouquet of two-dozen red roses in a vase. Flower arrangements for this event were created by Valley Center Floral. Final products included digital images online and on disk, and prints that were delivered in premium photo folders. The second posed photo station for another Discount Tire 2013 Celebration and Awards Photography at the Hyatt La Jolla San Diego, featured a solid red background with props. Here we used a Diamond Cloth backdrop, a wrinkle-free and muslin-like fabric. Branding and theme elements were introduced for these posed event photos. Using a prop to simulate a stack of tires from the 50′s, guests were also invited to use various props such as hats, walking sticks, gloves and feather boas. 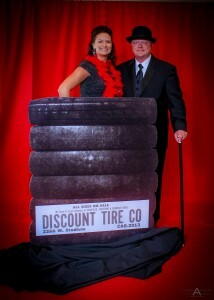 This created a fun theme of yesteryear for the Discount Tire corporate event. Final products included digital images online and on disk, and prints that were delivered in premium photo folders. 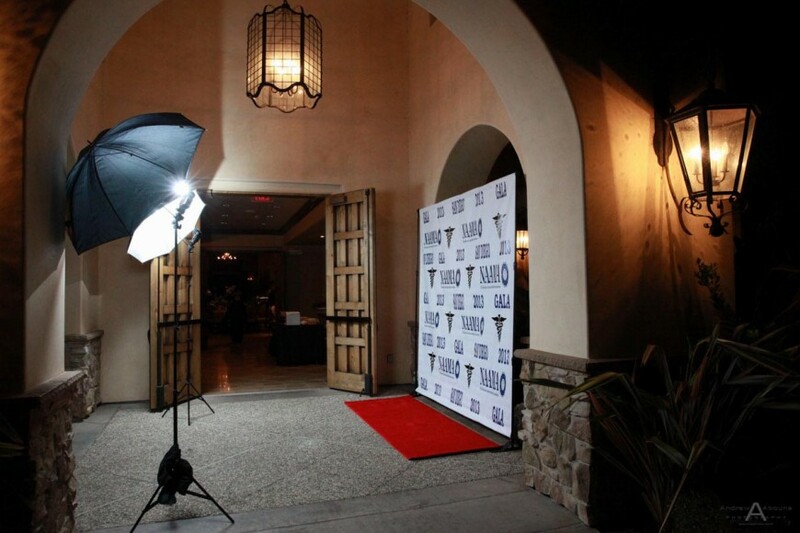 A Hollywood paparazzi theme with red carpet was created for another Discount Tire Celebration and Awards Photography event at the Hyatt La Jolla. Another example of a hand-painted backdrop, it created a very specific theme. When combined with props of top hats, walking sticks, white or black gloves, and feather boas, a glitzy and fun posed event shoot was created. Virtually any theme can be created using backdrops with murals, ranging from this paparazzi theme to urban or even Monet settings. Final products included digital images online and on disk, and prints that were delivered in premium photo folders. A formal photography backdrop was more appropriate for the Prudential Insurance Client Conference at the Omni La Costa Resort & Spa, in Carlsbad, CA. 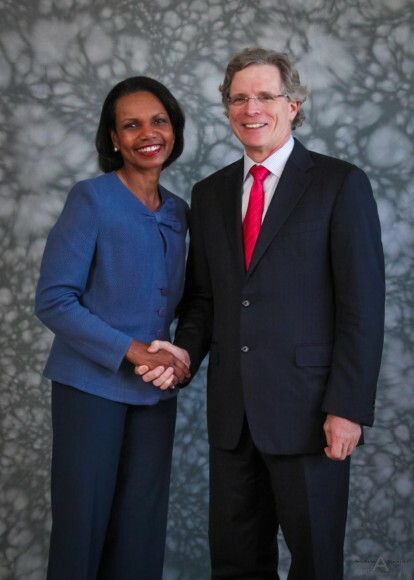 The shoot included posed photos of top Prudential executives with their VIP guest, former Secretary of State, Dr. Condoleezza Rice. A neutral yet professional color scheme of muted grays, together with even lighting, helped provide appropriately professional event photos. Final products included digital images online and on disk, and prints that were delivered in premium photo folders. Formal photography backdrops like this, or even hand-painted backgrounds can also be used for headshots. 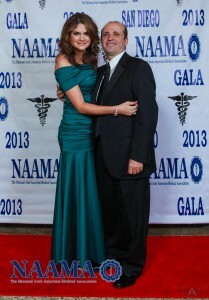 NAAMA step and repeat with couple on red carpet. 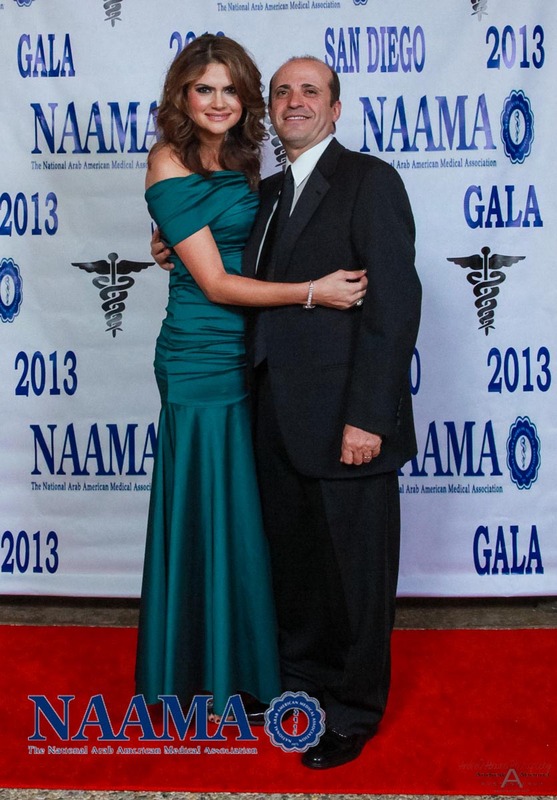 Most recently, we shot posed photos of guests for the National Arab American Medical Association (NAAMA) 2013 Gala at Maderas Golf Club in Poway, CA. The adjacent photo shows one of the photos from the NAAMA event. Step and repeat background often have the name or logo for a company or organization printed directly onto the background. In addition, the event name can also appear, as shown in the NAAMA photo. Step and repeats are a popular and affordable ways to create a quick and simple branding for an event. And they aren’t limited to posed photography either, they also work well when we provide candid or paparazzi-type event photography. As an added touch of glamour, a red carpet event can also be created, as shown in the NAAMA photo. Final products included digital images online and prints that were prepared onsite in event folders. Sometimes nothing can match the excitement and name branding of posing with a recognized character that is dressed as a company’s icon. 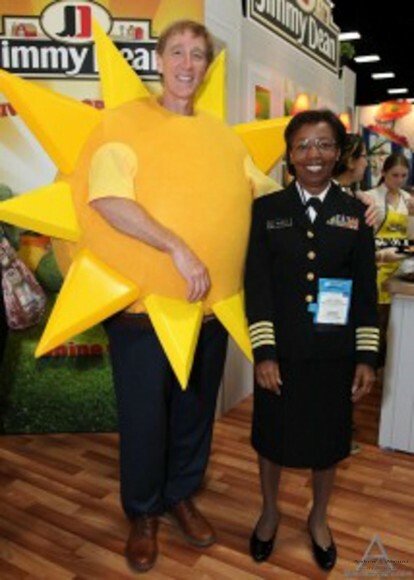 For Jimmy Dean’s ‘The Sun’ at the ADA Food and Nutrition Conference and Expo at the San Diego Convention Center, guests were photographed posing with the Jimmy Dean’s icon in front of their company booth. It was the booth that served as the backdrop for these posed event photos, and together with The Sun, the company name atop the booth worked perfectly for branding. Jimmy Dean also requested that we provide guests a shot card, which we created to hand to guests with their image number and instructions on how to download their free photo from an image gallery we hosted for the event. With any of these seven onsite posed event photo and backdrop ideas, together with any necessary prop extras, proper lighting, good service, and the all-important post-processing, event coordinators can make sure their guests receive unforgettable event photos. From formal to fun, standard to the imaginative, posed event photos can be a key part of photography to any type of event.